Drug Delivery Experts (DDE Labs) is a contract R&D drug delivery laboratory located in San Diego’s emerging biotech sector that specializes in drug product development. We have the expertise to integrate drug delivery formulations with the appropriate device to maximize commercial potential. DDE Labs was created in 2014 to address the gap of good outsourcing partners in the formulation and drug delivery technology landscape. We specialize in drug-device combination product development and integration of formulation and delivery system approaches with commercial strategy and life-cycle plans. We work in the injectable products space as well as alternate delivery systems. Each of our experts has more than twenty years of experience in pharmaceutical research, development, and commercialization. 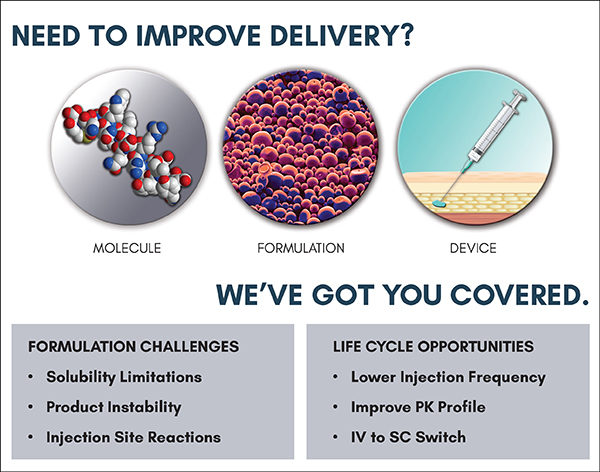 Our experts can customize a drug delivery solution that best meets your product’s need. DDE Labs’ proprietary technology involves new salt forms of active pharmaceutical ingredients, including peptides, proteins, antibodies, oligonucleotides, and polysaccharides. These salts will be used in a variety of new drug delivery, formulation, and pharmaceutical applications ranging from extended-release injectable products to co-formulation of active ingredients in injection systems, and stabilization. DDE Labs has also developed a novel device technology designed for oral delivery of active agents to the GI tract. This unique delivery device enhances systemic bioavailability and allows controlled delivery to various regions within the GI system or other organs. The oral capsule device may be used for improving the systemic bioavailability of poorly absorbed compounds such as biologics, biopolymers, and small molecules. This record has been viewed 1073 times.